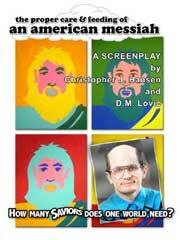 Underground Film Press is proud to announce the second release in its e-book screenplay series: The Proper Care & Feeding of an American Messiah, co-written by Chris Hansen and D.M. Lovic. The full shooting script for the hit indie film is now available to download from Amazon’s Kindle store for $1.99. The Underground Film Journal originally reviewed this film all the way back in 2006 when it was still on the indie film festival circuit. It has since gone on to be released on DVD and is available to watch online on Hulu. So, now you can watch this hilarious religious spoof, then read the screenplay to see how the film developed from the written page to the screen. Plus, the script contains many scenes not included in the final film. Both the script and movie tell the story of Brian B., a man who believes he’s been appointed a regionally-approved messiah by government agents. Shot — and written — in a mock-documentary style, American Messiah details Brian B.’s quest to discover his “special purpose” and to quell the fire that’s quite literally burning in his belly. Interviews with the screenwriters also included in the e-book detail the genesis of the entire project, from the initial creation of the character of Brian B. by D.M. Lovic, to the full development of the feature-length screenplay, including the additions by Hansen of the messiah’s sycophantic siblings, Miriam and Aaron. The Proper Care & Feeding of an American Messiah is a great religious spoof, poking fun at modern extremist evangelism.